Medical Transcription Week – May 15-21 | You Empower Your Health! 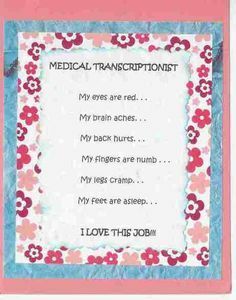 Again, Happy Medical Transcription Week everyone. Thank you for your hard work, your unique listening ear, your fast fingers on the keyboard, the long hours you put in, and your dedication to helping keep safeguard of each and every patients medical record! A well-trained medical transcriptionist who remembers traditional transcription Interpreter Services Toronto realizes that even to this day, it would be simpler to transcribe the entire report than try and ‘fix’ the edited/voice recognition version. Exactly right! Problem is, are the physicians willing to go back to dictating full reports and not having entered in the EHR? I really doubt it. There’s been too much money spent on developing EMR/EHR, so facilities are finding it simpler to have a scribe transcribe there work, both clinics and hospital settings.